Tell President Aoun and Northeastern Administration: Full-time faculty are educators, not managers! We have a right to a free and fair union election! 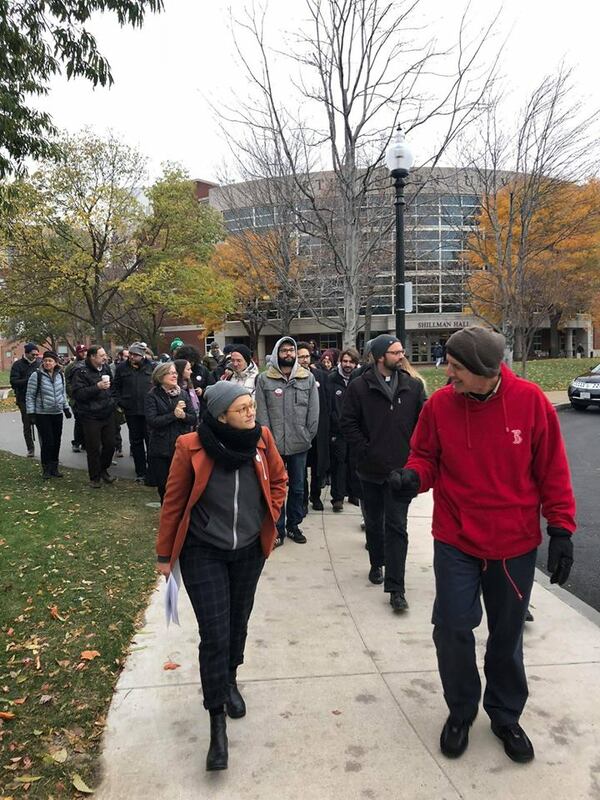 A group of faculty, along with dozens of students and community allies, delivered the letter to President Aoun’s office, which has now been signed by over six hundred individual supporters and two dozen community organizations. The President of SEIU Local 509 called President Aoun to have a discussion about the issue -- he has not heard back from President Aoun or his office. (SEIU Local 509 is the union that represents the adjunct faculty at Northeastern as well as adjunct and FTNTT faculty at BU, Tufts, and Lesley). Massachusetts Senator Elizabeth Warren wrote a letter to President Aoun with a similar message. President Aoun has not responded to any of these calls to uphold our rights as faculty. He has refused to offer an explanation for the administration’s stance or even acknowledge the administration’s actions. While we are disappointed that the Northeastern administration chooses either to remain silent or profess ignorance on the managerial issue, we are not discouraged. We know that with your support, President Aoun can’t ignore us forever. We are holding a rally on February 6th to ask President Aoun to respect our right to vote. Already we have students, tenured faculty, elected officials, and community supporters confirmed to support us. It’s time for President Aoun and Provost Bean to stop ignoring this issue and let us vote. Can you join us at this urgent moment and make sure our voice is heard?